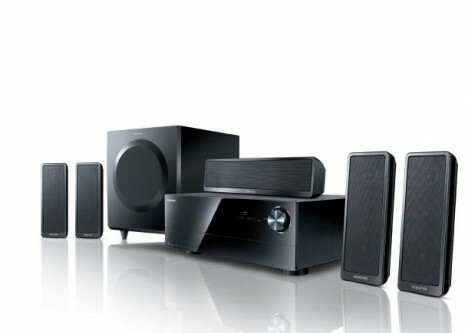 Samsung offers another affordable home theater system package to movie fans, music lovers and console game enthusiasts. The new home theater system, Samsung HT-AS730, which is expected to hit the store shelves at April end, comes with five speakers, one receiver/amplifier and an iPod/iPhone dock. The elegant look and piano black design of the home theatre set is ideal for those who have their own disc player or game console. Users who have their Blu-ray players and other high definition gear can create a superb and robust surround sound atmosphere via the 650 Watt amplifier and 5.1-channel speaker set. The Samsung HT-AS730 home theater system doesn’t consume much space and it can be easily fixed in any room. The Samsung Auto Sound Calibration technology in the home theater set will optimize and balance the surround sound setting to ensure optimum sound quality regardless of the room size or design. iPhone and iPods users also can make use of the iPod dock for some music. The full Samsung HT-AS730 comprehensive package is priced at $499.